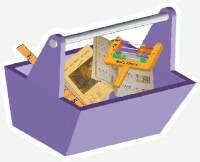 LearnTools Inc. was founded to bring Mac's Abacus into the lives of young children. Other products are in the planning stage (Click [Store] to see the latest product additions). It all began in October 2011 as I was thinking about what kind of Christmas Gift I could make for my granddaughter, MacKenna (Mac). She had just turned 5 and her mom was teaching her how to add. On a visit, I asked Mac “how much is 3 plus 5?”. She drew 3 dots of a sheet of paper, and then drew 2 more dots. Next she put her pencil down and touched each dot with her finger, saying the count as she went “one …two …three …four …five”. Then she wrote down the answer 5. I was so impressed with this method of learning numbers because it was so real and so direct. All five objects (the dots) where there for us to see and touch, making the “Quantity of Five” completely visible. This was also a demonstration that the quantity “5” can be composed of two other quantities (3 & 2). Applying the same process to (1 & 4) reinforces the notion that 5 can be composed of other combinations. That counting-of-dots experience brought a vision of an Abacus to mind. The Beads can be the Dots! One can touch them, group them, and count them up. An Abacus would be another great way to deeply experience numbers …to see their size, their possible combinations, and how the can be added or subtracted in a consistent way. This is Math in its most basic form! So I proceeded to design an Abacus that Mac could hold in her hand, and that had just enough Bead Rows to count up to reasonably large numbers, yet not become unwieldy or overwhelming. Four Bead Rows was adequate and it could easily hold counts up to 9999. Of course, Mac's Abacus needed a book with Instructions on its operation, as well as a collection of interesting problems. It took two months to write this book. I good friend of mine printed and bound it for me just before Christmas. Mac loves to build things, so I designed her Abacus as a kit that she could build herself and it came with illustrated assembly instructions. I used Pony Beads that I found in a nearby Park where I frequently take walks. (I make it a point to pickup litter as I walk, which led me to find a large number of Pony Beads scattered in the grass near picnic tables.) I took the beads home and washed them. There were enough beads to make each Bead Row a different color! Mac got her Abacus Kit for Christmas 2011. A few days later, she came over and built the Abacus on our kitchen table. She really enjoyed putting the parts together. Once it was built, I discovered a serious problem: These Beads slide around when the Abacus is handled, so they loose count easily! In near-panic, I quickly put a piece of tape at the middle of each rod to coax the beads to at least stay on one side or the other. But a more permanent method was really needed. While developing Mac's Abacus for MacKenna, I became aware that this would also be a great gift for all children. So, after Christmas, I began designing the “production version”. It took two years to design a Bead that would slide easily, yet stay in place if jostled. Also, the scope of the workbook was broadened to accommodate younger kids, those who perhaps had never even counted anything yet. It would take them from the beginning, a small step at a time to where they become able to add and subtract within our Decimal System. It would also teach them to recognize and figure Money. After more than two years of evaluations at schools and day care centers, Mac's Abacus Basic evolved into a set of 300 colorful picture Lessons (no words at all) which thoroughly presented the sequence of concepts needed for a deep understanding of early math. I am awed by the vast and varied talents within Humanity, and how these abilities combine to produce our Quality of Life. The purpose of LearnTools Inc. is to provide products that support and enhance one's personal development so that we become more able to achieve to our potential. Our abilities define us …they give breadth to our insights and deepen our understandings. They define the very depths of our being! Mac's Abacus Basic is our flagship product. I believe that it is an advancement in the methods of instilling a sound, fundamental and thorough understanding of Numbers and of our Decimal System. My hope is that an early presentation of this colorful, tactile, hands-on series of Lessons will not only give many children an early and deep understanding of numbers, but will also capture those kids who are not so inclined towards Math; that it will reach them at a stage before they fall behind their peers and thence become frustrated …perhaps avoiding math thereafter. We have spared nothing in striving to present the most appealing Lessons, in a full color workbook of highest quality. We even developed our own font (KidsFont) so the numbers and letters are made the way children are taught to draw them. Product testing had shown that kids like to count the colorful arrangements of objects in Mac's Abacus Basic workbook. Mac's Abacus is ruggedly constructed using Hardwood, Aluminum Rods and Polypropylene Beads. All parts are non-toxic and washable. The “Memory Beads” (pat.9,880,582) have been tested to stay in place for well over 200,000 moves. Mac's Abacus will also become available in “kit” form, so parents have the option to help their child enjoy building his/her own Abacus. All our products are Made in U.S.A. We insist upon quality U.S. manufacturers to supply the wood parts, rods, beads and workbooks. These are assembled and shipped locally. Ray Herrmann, CEO and Product Developer. Ray is a “retired” Engineer. He has designed many mechanical, electrical and software devices over the years. Gary is Ray’s son. He has a degree in Computer Science and experience both as a Business Analyst and Project Manager. Gary has worked with Ray for about six years on Mac's Abacus and the many tasks required to run a company. His efforts as advisor, planner, reviewer and manager have been indispensable in bringing this project to fruition. Gary will continue working to help bring this and other future products into our lives.